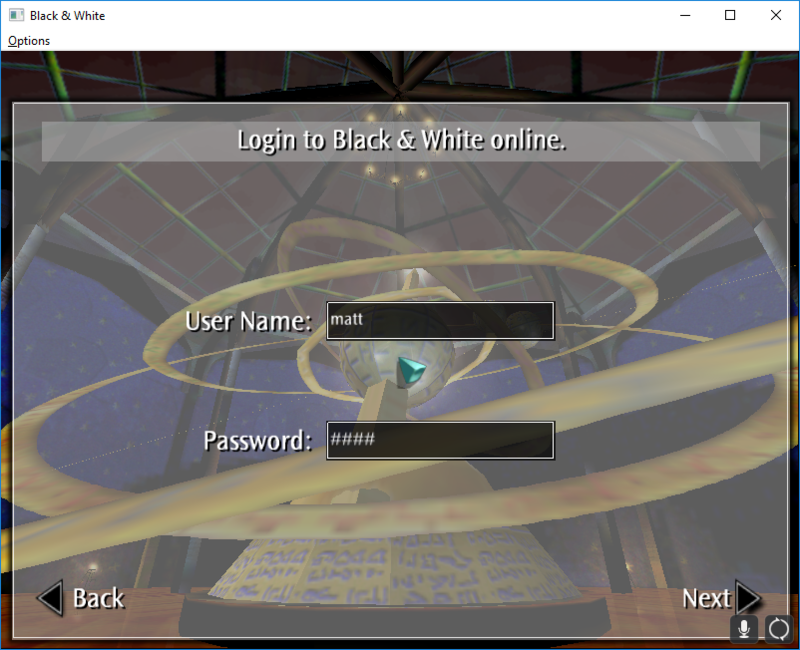 The official servers for Black & White were shut down in 2005, this project is an attempt to emulate them completely to allow multiplayer connectivity across the internet for anyone and to offer the same services provided between 2001-2005 by bwgame.com. This post is a reflection write up of my GitHub repository bw1-mp that I worked on during October 2016. We figure out how to mimic the bwgame.com servers to allow a user to login and lobby, the next step would be to replicate GameSpy. Our first target to attack is the login server, we need to imitate the expected values in order for our game client to get anywhere near the online process. When you first start the multiplayer client you are greeted with a login screen asking for your username and password; when the game first came out you were required to register your username and password with your CD-Key online. Using Wireshark we can monitor all network traffic the game attempts to send to the server, however as there is no server we can not determine what the client expects as a response, so we will require other methods such as guess work and disassembling the game’s binary. Submitting the form with the username and password set to matt matt will generate a HTTP GET request to login.bwgame.com:80 with the username and password as query strings, knowing this we can easily create a simple authentication system - now let’s work on the response. Like I said before, this isn’t as easy because we don’t have any packet dumps from the actual server to work on. We’re going to need to open our disassembly of the game and see how the client handles the response data to create a response. Responding any data not in the correct format results in an incorrect password dialog. We can immediately tell the first digit is a unique user id, the rest of the values are currently unknown and don’t seem to effect anything noticeable. We can look into them some other time. Sending a response of bnwuserid:1 1 1 hello is enough to get us past the login and onto the next step. Firstly, there is a very simple GET request made to storage.bwgame.com/bwmaps/ConditionTemplate.txt by the game client. 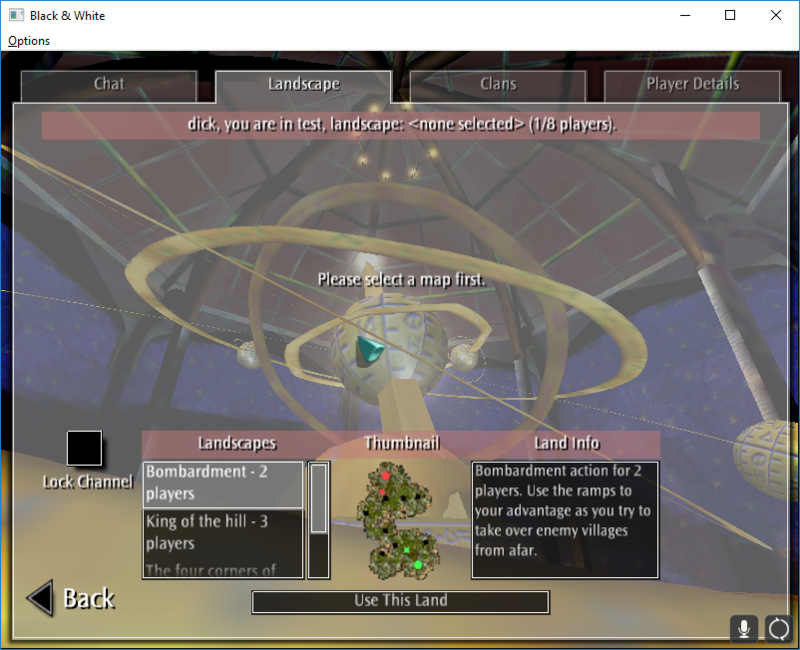 ConditionTemplate.txt - is a very basic CSV file format and luckily a copy is included in the game itself, this file contains the win conditions for all the different multiplayer maps. 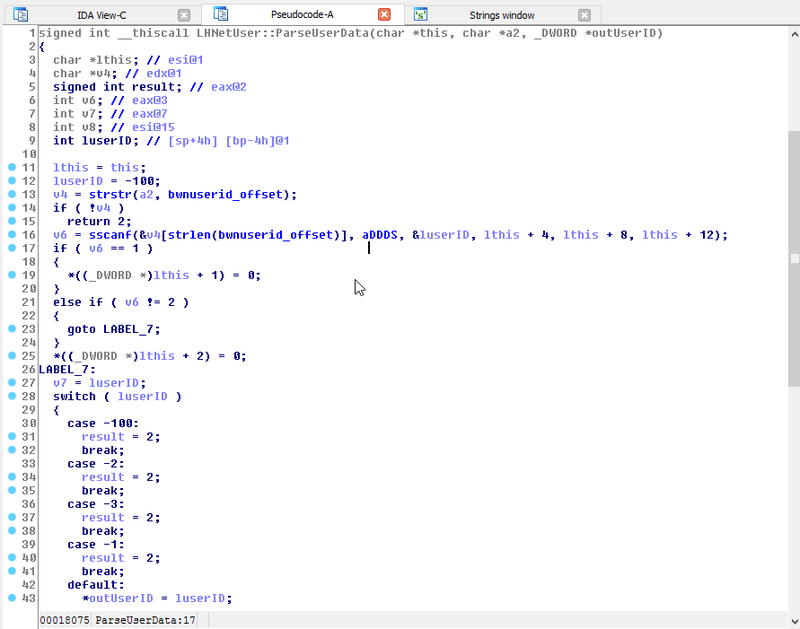 We simply respond to the request with our copy of the file, no obfuscation or encoding on this. Without this the game client refuses to go any further. Most of that data is self explanatory, except dbflags and query. This one stumped me for quite a while but basically dbflags is the plaintext length of the unencoded and unobfuscated query parameter. Looking into the query parameter, Lionhead decided to use their own base 26 [A-Z] web encoding, so for every 2 characters just 1 full byte is represented. We simply take each hex digit, and add 0x41 (65 dec) to it. 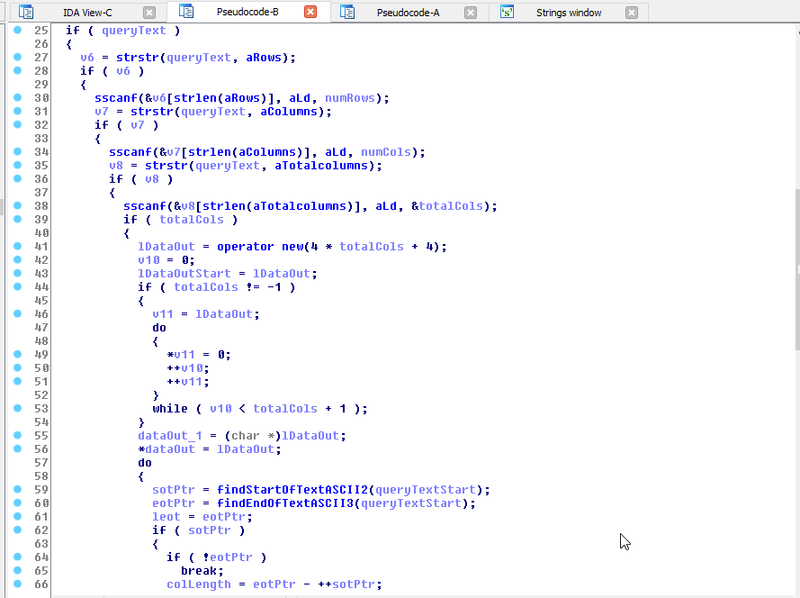 Using this we can now decode our query string…. partly. Using our newly created LHWebDecode procedure on the query string the client sends the server HPFFEGFCCPIKEOFDCMFIFBEJCJABCNLM, we don’t get a neat ASCII string like I was expecting, we get a jumbled array with many unprintable characters. Diving into the disassembly some more, the reason they encode the query string in the first place is because they first obfuscate it. The encryption would be difficult to figure out if it wasn’t for the constant 0x9E3779B9 or in decimal 2654435769 which is equal to 232 ÷ φ. This is a common constant in Fibonacci hashing. Luckily for us, the keys are included in the game client. Encryption cracked, you can see the completed functions for encryption and decryption here. We can ascertain that the client expects a table of data in the response, the client loops through each byte of the response looking for the byte values 0x02 (ASCII STX) and 0x03 (ASCII ETX): start of text and end of text. For each pair of these, the data in between them is treated as the column data. The column headers are assumed from later work disassembiling the game, hostname & download folder are used by the client to download maps they do not have. Responding to the original query request with the above data string, our client accepts the data as valid and continue through the process. The tables don’t have column headers, I just add those to make data representation easier to understand. After our client receives the string \0x2peerchat.bwgame.com:6667\0x3[rows]:1[columns]:1[totalcolumns]:1 the game client will open a TCP connection directly to the given hostname + port. Before we examine the TCP connection stream anymore, it’s important to know what Peerchat is first; the original Peerchat server was written by GameSpy and used to be hosted on peerchat.gamespy.com - until it was shutdown in 2014 making hundreds of games multiplayer modes completely useless. It enabled a simple way for game developers to create lobby based game systems enabled with cd-key authentication and encryption. PeerChat is also however just a classical IRC server which uses a very simple encryption - and Black & White doesn’t even use the encryption. If we go back to our TCP connection stream now and examine it, the client makes the first move by sending a simple USRIP\r\n command. Luckily aluigi has already reverse-engineered the Peerchat protocol and we can see the response we have to make. The multiplayer pretty much entirely works over the Peerchat/IRC protocol - you can create games which basically creates an IRC channel #GSP!bandw!X14saFv19X where the name partially matches your encoded user credentials. Rooms are passworded, locked etc.. using default IRC modes and the creator is channel OP. NICK BNW_536871013 - The argument is basically the UID we provide in login but with the bitwise operators UID & 0x1FFFFFFF | 0x20000000 applied making the value a much higher integer. USER X14saFv19X|536871013 127.0.0.1 peerchat.bwgame.xyz :matt - The first argument is our users encoded IP address and their bit operated UID (let’s call it GameSpy ID), 2nd arg: their hostname (always 127.0.0.1? ), 3rd: the server name, 4th: b&w username. We’ll look more into encoded IP addresses later. Whenever the Refresh List button is pressed the client sends a join, waits (more like hangs whilst it waits for a response) and then leaves the channel. This happens when the client first logs in too. It is unclear right now what the game expects as a response but we will look into it later. Logging multiple clients into the game works, but they can not see each other games in the list yet. 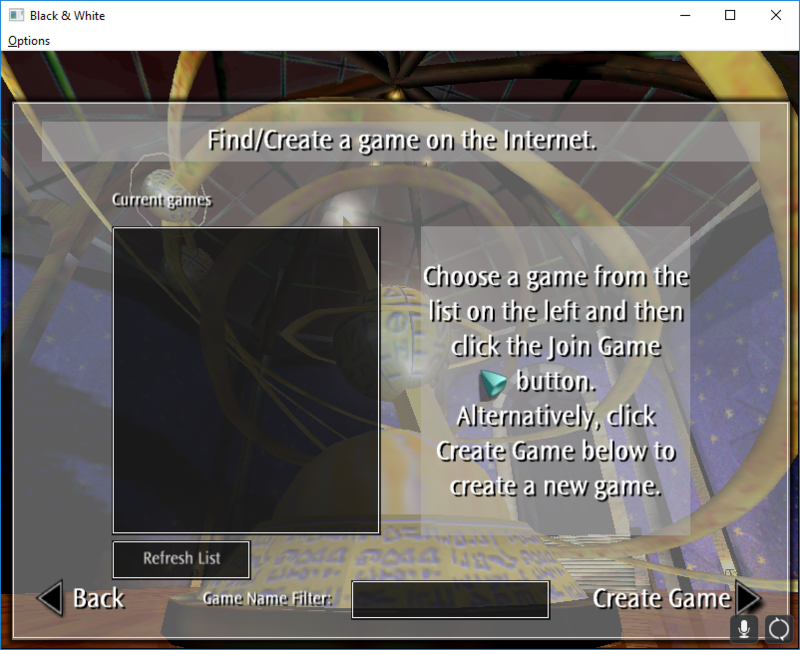 Emulating bwgame.com servers is pretty much done now, all we need is a GameSpy peerchat emulator and we would have a complete lobby functionality. All code is publically available on GitHub.